30,000,000 blocks in each direction; ((30,000,000 x 2)^2) x 0.000621371 = 1389649284 mi^2, or roughly 7 times the surface area of the earth. This is fact. This isn't from ancient wiki articles that people heard of from a guy whose brother read it back in '09. I actually tested this in game. It took pretty much all of my RAM. Actually, it's less than half the surface area of Uranus. I like how everyone says "well the world is infinte, but you can't go out past 30,000 kilometers." If you can't go past 30,000 kilometers out, and the world only generates for a few hundred meters at most past your position, then the world can't be any more than 30,000 kilometers plus a few hundred meters out, now can it? Do you really need it almost a billion blocks from spawn. If you built two towns 3k blocks from each other, and connected it with a railroad, it would take forever to complete. You dont need more that 5k usually for a world. It is not infinite worlds, but it takes 30 million blocks to reach the end, approx. 80 hours walking time. Also, if you were to generate every sort of possible block, the hard drive needed would be 40TB. You don't need it to be that large, and it isnt cheap. Bit off there buddy, it would take 820 hours of walking. Limitation is in the tp command. Go ahead and issue the command normally to get the error message. You can use /tp <player> 12345678 200 12345678, and then use relative teleportation (/tp <player> ~12345678 ~0 ~12345678) to keep going. I think it tops out after the first repeat, however. Error message seems a bit bugged since it seems to contain the format string. Practically, it is. Unless you are making modifications to the game or using various map editors or map tools, in which case you should be aware that the practical infinity of the world is not technically accurate. is mojang cheeping me? Because i want infinite worlds where i can do and go wherever i want whenever i want and this is just cheep. Anyone else have simalar problems? No. I mostly play Vanilla Survival though, so I'll never encounter those sorts of issues since I cannot use commands as I have it now. What you are neglecting however is that if you did teleport to X:123456789 Z:987654321, what did you expect to find? And you surely are aware just how much area that would skip over, for no good reason? If you want to be able to teleport to arbitrary locations, well, that's fine. But don't make excuses for using those arbitrary numbers that aren't rooted in reality. Being able to put in arbitrarily high numbers has nothing to do with infinite worlds because the "infinite worlds" thing is more a practical limitation. I'm not really sure how having arbitrarily large values on one or both axes makes things fun. The limitation is purely from the /tp command. However, when I multiplied my position by 10 in level.dat I got disconnected by the server "Illegal position". Triggers at 32,000,000 meters. That's around the area that floating point errors become pronounced enough to notice, too. I think you mean unless every single person playing minecraft had a house on that server. Anyways seriously, do you really need a world that will reach that far out? The 32,000,000 'limit' is already insanely high, which almost no one can reach by conventional means. You could play for a month straight, without any breaks of any kind (including bathroom, sleeping, and eating), and still not reach the end of the world just because of how massive the gap from the spawn point to the 'edge' is. While it definitely is not the 'infinite' like it is advertised to be, it essentially is one-hundred times more space then we'll every dream about using in Minecraft. @Acro, you play classic......you dont even know what im doing with that map!?! Technically MC worlds are infinite, but if you go far enough then you reach the farlands. The farlands are basically just terrains stuffed together in a humongous mess of land, and they screw up maps. Also they cause huge lag because of mobs spawning and rapidly despwning because of they weird lighting and infinitely falling blocks. The worlds are technically infinite, but eventually the save file will get too large. Supposedly, the maps are 8 times the size of the earth. There is an end, and it looks like a wall of grass, stone, gravel, etc. It's MEGA laggy, and sand or gravel doesnt even obey gravity. There isnt an end because You can get past the wall, but it's almost impossible, with the amount of lag. No, it's a square 32 million (?) blocks on each side. Yeah, that's cool, isn't it? I posted a link on the second page too. From that visual comparison, a Minecraft world has a length along one edge that's about the same as the diameter of Neptune and/or Uranus. Give or take. So, the surface area of those planets is larger than a practical Minecraft world, I suppose. THAT IS NOT HOW MINECRAFT IS BIG, IT IS JUST A SCALE OF THE UNIVERSE NOT THE MINECRAFT UNIVERSE!?! It is not infinite worlds, but it takes 30 million blocks to reach the end, approx. 80 hours walking time. i've made the math, and 30 million blocks is about 6 months nonstop of walk, if you consider the terrain perfectly flat and no oceans. I'd like to see someone walk nonstop for 6 months just to prove how big the Minecraft universe is. I suppose since it's so big, and no one would actually walk just to find the end, people just consider it to be infinite. I know the answer to this one already. The Minecraft worldspace is NOT infinite. Remember back to the old Far Lands. World Generation went completely haywire when you encountered it, causing massive lag. But let's say that you were able to cross it nevertheless. The Minecraft Wiki says that past the Far Lands walls, there is a border, where in past versions of Minecraft, it did various things. Starting from early Indev: The Far lands didn't exist then, but the border DID. Upon crossing this border, the player is locked into position, unable to move, unable to do much anything, really. From Indev till after Alpha, this took place. In Beta, however, this all changed. The Far Lands swiss-cheese-like world gen occurs upon going 8 days worth(I believe) of real time from the center of the map toward north, west, east, or south, but not diagonal. Same effects for the border, but only for a while, as Notch was trying to fix the Far Lands at that point and failed, making the game crash in some related cases. 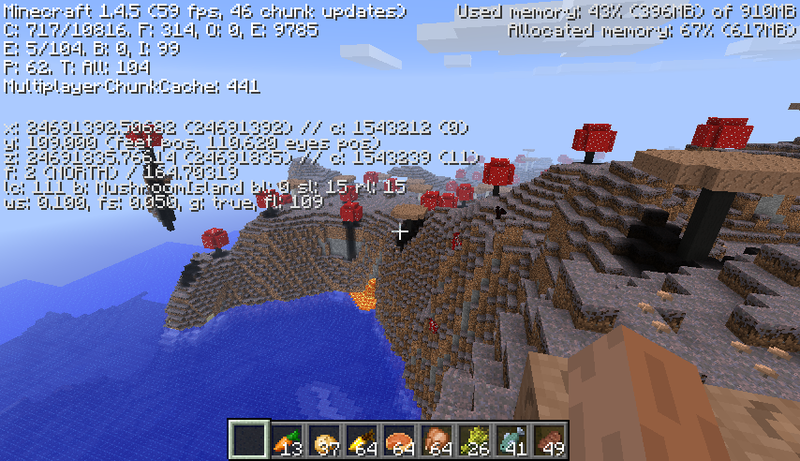 Now, The Far Lands still exist, after Notch screwed up trying to patch it, and ended up leaving it in. The border mentioned before still exists, too. However, this border actually does not exist in the worldspace. The border is actually an assortment of completely FAKE 16x16 chunks. When I say fake, I mean that they aren't solid, and no world force or element(like light) reacts with them. This means that you can't put light upon the surface of the blocks of those fake chunks, nor can you walk on them. If you try, you'll fall through to your death. There IS also a SECOND border, just a few chunks behind the fake ones, but the only thing this border does is freeze the player as it did in Indev stage. *PHEW* Loooooong explanation, I know. But I hope you understood all that. Hope this answers your question! EDIT: To the above post... THERE YA GO! It is infinite in that no one person, nor a group of people, will ever be able to explore the entire minecraft world without the use of movement modifications and a very high end computer / server. Farther than that, but the 8 times Earth is all us mortals can walk on. After that 8.000000001th Earth, the ground becomes unworkable and quickly kills us. Worlds are not infinite. They are approximately 8 times the size of Earth. Once you reach a certain point, computers have a problem rendering more.